Wandering around #MWC15 in Barcelona this year I got involved in a bunch of conversations about Apple Pay, Loop, NFC and so on. But I thought that focus on the physical, in-store interface, could be diverting people away from the central strategic shift to in-app payments. 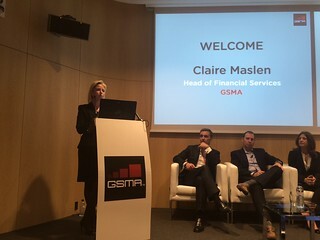 The GSMA very kindly invited me to speak in their mobile payments session at this year’s Mobile World Congress and it was a terrific experience. 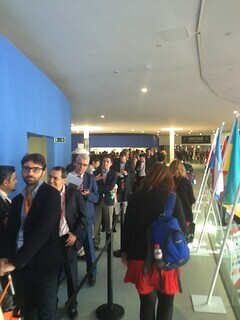 The room was packed solid, the overflow room was packed solid and the GSMA had to turn away a further 148 people who were still in line but couldn’t get in. It looks as if the interest in mobile payments is still growing. Wow. 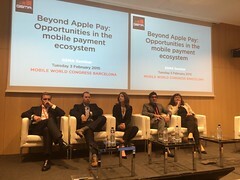 I was genuinely surprised to see the massive line to get in as I strolled down to the session, which was led by the GSMA’s Senior Financial Services Manager, Claire Maslen, and she kicked it off with a terrific panel discussion covering Apple Pay. 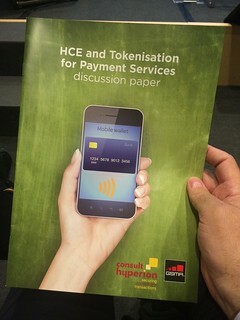 tokenisation, HCE and such like and other new developments and their impact on the mobile payments world. I was there to talk about in-app payments and to encourage the delegates to see the strategic opportunities in this field. I think I had a bit of good luck, having chosen the right topic at the right time for the right audience. And, what’s more, I think I chose the right practical examples for people! @dgwbirch wins again for most entertaining presentation @MWC15MCommerce but also outed as Mexican food fiend- who knew?! Since the talk was a) short and b) mildly well-received, I’ve put it online at Slideshare for people to view (and, I hope, to comment on it). There were really two points I was making in the talk. The first was that while the title of the session included “Apple Pay”, I wasn’t really talking about Apple Pay at all, but using the fact that Apple’s incredible marketing presence and mindshare had in the first instance at least legitimised “our” sector and refocused attention on the possibilities. Multiple sources confirm that Google Wallet saw a jump in payment volume following the launch of Apple Pay. The second, and key, point of my talk was that while much of the talk at the Congress was about what I’ve previously called the “last millimetre” using NFC, RFID (and now Loop) to link the phone to the point of sale (POS) in the store, the really disruptive impact of the Apple Pay, tokenisation and strong authentication via mobile would be away from the “traditional” POS because bringing chip-and-PIN levels of security and convenience to in-app transactions will change the way that we pay pretty quickly. It’s an alignment of merchant, consumer and scheme (bank) interests. Now, before I go further, I must acknowledge that I’m hardly the first or only person to make this analysis. But while [Apple Pay’s] new easy and secure payment method could very well disrupt the offline purchase experience, its biggest impact could ultimately end up being in-app and on the mobile Web. The kind of points I was making in the talk couldn’t even be classified as predictions, in my opinion, since a few months on the from Apple launch the trends are absolutely clear. Apple Pay’s in-app purchasing capability is often overshadowed by its physical iPhone-powered NFC counterpart, but for big-box office supply chain Staples, the feature has quickly become the most popular method of payment processed by the company’s iOS app. You can see why. Whatever the conveniences and additional value afforded by mobile payments (and I believe there are many, which we’ll come back to in a minute), my chip and PIN card works perfectly well in shops around the world, but my card number, expiry date, address, name and three-digit code are a pain in arse in web sites and apps. I’ve commented before on just how quickly TouchID changed the way I interacted with apps and I don’t doubt that Apple Pay will do the same. My KFC app will switch from using “card not present” (CNP) with the attendant rules and rates to using TouchID which will in time (I confidently predict) deliver better rules and rates than chip and PIN because of the additional security inherent in the tokenised mobile solution. I also said, more controversially, that I thought “app and pay” would overtake “tap and pay” at physical POS as well. The reason that I think this is that I’ve heard merchants telling our clients that rather than new and improved POS terminals of all description, there are many retail environments where they would prefer no POS terminals at all. When it comes to specific retail environments, the retailers’ own apps are always going to provide a better experience than “general” solutions. This connects with something that I’ve written about before. The Euro Banking Association’s Working Group on Electronic Alternative Payments published an opinion paper on Digital Identity back in May. It was called “From check-out to check-in” and it is rather good. Right now, I use my mobile payment app/sticker/watch/wallet/whatever to check out. In future, I will use my mobile app to check in to the shop, restaurant, event and so on. That’s how they will deliver better service, more value an all-round better experience. When I’ve finished choosing the pants, eating the meal, selecting a souvenir then my purchases will taken care of safely, securely, cost-effectively and almost invisibly. You can imagine finishing your meal and wandering out of the Angus Steak House and having your Angus Steak House app pop up and tell you much the meal was, remind you that the receipt has been downloaded and stored (in case you need it claim as a valid business expense), confirm your new Angus Steak House loyalty points total and ask you to confirm the recommended tip amount. POS? What POS?
. @dgwbirch great keynote! There’s a full audience in the next room watching you on live video. We had a good laugh with your real examples! So, to recap. Mobile, tokenisation and convenient authentication. Put all of these things together and you get a picture of a future where you will be using your Tesco app to pay for your groceries (using Apple Pay, Google Pay, Samsung Pay etc inside the app) whether you are in store, browsing their web site or calling in your order on the phone. A Waitrose app, a Tesco Metro app, a Boots app and a BP app would cover 90% of my household’s weekly discretionary spend: hence my prediction of in-app dominance. For many of our clients, the growth of in-app opens up an wide spectrum of new opportunities. I’ve seen some of the things that my colleagues at Consult Hyperion are working on for clients already, and it’s great, great stuff. Thank you again GSMA for bringing together such a great panel and giving me the opportunity to join them to speak. Oh, and finally, and a big shout out to Burrito Mama. They promised me a free burrito if I tried out their app, which I did and they were true to their word. If anyone else has an app they’d like me to try (especially if it involves free Mexican food), you know where to find me. Is the “discussion paper” available online somewhere? I don’t know but I will check with GSMA tomorrow.